Purple Emu AR All Natural Acne Treatment Creme O.T.C. With Emu Oil 2 oz. Jar. I suggest starting with the smaller .5 ounce size AR Acne Treatment Creme. If you are using this strictly on your face the .5 ounce size should last about 6 weeks. Use AR Acne Treatment Creme very sparingly. More is not better with this product. You may feel cooling and tingling when first applied. We suggest that you start with a ‘spot test’ on your face. Do not apply over your entire face the first day. Start with a small part of your face such as the chin area. Remember, you may experience a flaring or increase in blemishes the first several days. This may not be the most pleasant time for you, but your reward will be that you will clear up your acne blemishes. This is why we suggest a spot test. Start in a small area so that you know what to expect. During the first week of use you may experience some exfoliation of your skin. This is a normal process and will subside. Clear, healthy skin will soon appear. DO NOT GIVE UP! 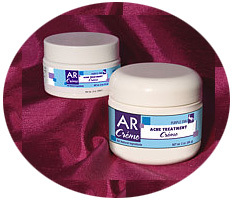 If you are using AR Acne Treatment Creme only on your face we suggest starting with the .5 ounce jar. This should last about 6 weeks. Remember, apply sparingly…more is not better with this product! AR Acne Treatment Creme is in the form of a water-soluble triple emulsion produced by a new US patented technology which enhances “through-the-skin” penetration of active ingredients. This technology eliminates the need for unfriendly chemical creme-formation agents which block the skin’s pores and may irritate the skin.